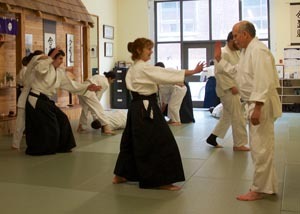 Aikido Shugyo Dojo offers classes 7 days a week. The first class is free and newcomers are welcome to attend the basics classes. See our overview of classes to find out which classes are suitable for you. For the detail of information, please see What’s happening. special events and holiday closures. interac through your bank for a small fee. Just send the password to the Treasurer to complete the payment. *Fees are due on the first day of the period. 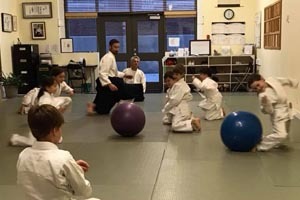 Students develop a solid foundation of fundamental techniques (including falling and rolling). More experienced students attend basics classes to refine their practice. Children and youths (ages 13-15) need permission to attend basic classes. Techniques tend to be more advanced and classes are at a brisker pace. Adult Advanced – students ranked 2nd kyu and above. The pace is quicker. While basic movements are still emphasized, requirements for advanced ranks are the focus. Facility in falling and rolling is required. Yudansha – students ranked ni dan and higher. Training is focused on more advanced kata and ukemi practice beyond testing requirements. Adult Weapons – all adult students who have 20 or more hours of practice. 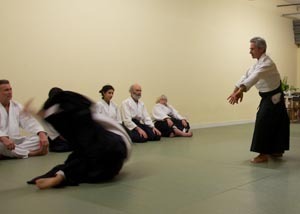 Weapons training is integral to aikido and enhances empty-handed practice. Students learn basic weapons techniques and learn the skills that are part of testing requirements. Youths (ages 13-15) require permission to attend adult weapons classes. A higher degree of basic weapons skills is required. Since training goes beyond the basic level, students must be already competent with fundamental weapons techniques. This is not a class but a training opportunity. Students come with a partner to work on techniques and/or prepare for testing. There is no teaching but an advanced student supervises.